Road trip day! I drove about an hour west to the Whitney Plantation. What a change from the plantations I’ve visited in the past. Since the late 1980s, I’ve visited three. The first one, Oak Alley, I think, was all Scarlett O’Hara, little to no mention of slavery. The second one, the Laura Plantation, seven years ago, was the rare woman-led plantation and slavery got a brief mention. The Whitney Plantation, opened in 2014, is entirely about slavery, with moving memorials that list all “the enslaved” (our guide’s term) by name and include photos etched into memorial walls and quotes with gruesome memories recalled by elderly people who somehow managed to survive the brutality of being enslaved on a sugar cane plantation/factory. There is also an emphasis on children who were slaves, with poignant sculptures of kids who lived there. Each visitor gets a pass to wear with a specific child’s name, a photo of a sculpture of the child and a quote from the elderly person who was once that child. Clever touch and it had us all looking in the church and old worn shacks and the Big House (which had a more sinister vibe then other plantations I’ve toured) for our child. Apparently the other plantations have cleaned up their act a bit and now mention slavery more, although none to the extent that the Whitney does. I was reminded a bit of concentration camps I’ve been to in Europe. Lunch was a bowl of hot gumbo at nearby B & C Seafoods on Vacherie, where I ate seven years ago with my London pals, Francine and Russ. Solid roadside joint with friendly servers and locals. From there I drove about an hour north and east to tiny Abita Springs, to visit a small folk art/grassroots art place called the Abita Mystery House, an old gas station packed with entertaining clutter/“found objects” that make fun of Southern stuff (UFO reports, Mardi Gras parades, voodoo). Reminded me of the town of Lucas, the grassroots art capital of Kansas. I drove around the narrow streets of the Bywater to see what’s going on there. Still a bit rough but gentrified in areas and lots of cleverly painted tiny shacks and cottages. I drove past the great music club, Vaughn’s and Bacchanal, the little hidden wine and cheese shop and bar. Tonight we had dinner in the Garden District at Coquette. Another clever southern food spot. We had grilled shrimp, perfectly seasoned, plus remoulaude and gremolata. The beef short ribs were fattier than I like but deliciously seasoned. I ate dirck’s trout instead, which was covered with brussel sprouts, cauliflower and preserved kumquat. Lovely. Light and tasty. The dessert was a stunner although it looked like a flop. (Or a tart I would bake.) It was advertised as a lemon tart but it was deconstructed so there was a puddle of lemon curd and another puddle of white whipped cream and a few little round cookies that served as crust, plus fresh satsumas and some green tart gremolata ice. It was full of unusual flavors that all worked remarkably well together. Dirck and I walked along Magazine street, window shopping and admiring the beautiful old buildings housing the shops. On a very chilly night (low 40s and overcast and windy all day, glad I brought my down coat), no one else was around. Here’s a story I wrote about the Grassroots art Capital of Kansas for the Minneapolis Star Tribune. Small-town Lucas attracts artists from way, way off the beaten path. 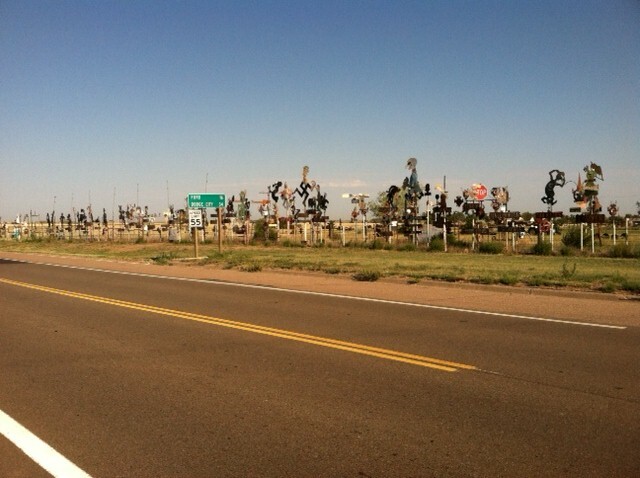 I was walking beside a quiet two-lane highway in north central Kansas, admiring sculptures scattered in the scrub­land, made from rusty farm implements, car parts and animal bones, when a small truck pulled up from a dirt driveway. It was the sculptor, waving. “Thanks for being interested,” he said. “I’ve got to go to work now.” Off he drove, onto the empty blacktop and into open ranch land. It was a fitting start to my latest exploration in and around the town of Lucas, pop. about 400, the state’s capital of “grass-roots art.” Also known as “outsider art,” this is the creative outpouring of self-taught artists located far from the mainstream art world (geographically, commercially, aesthetically), using unconventional materials and techniques. They are often retired farmers, mechanics, newspaper editors, funeral home directors (you name it) making stuff with whatever’s around — car bumpers, light bulbs, barbed wire, gum, horseshoes, tree trunks (you name it). Prolific (some might say compulsive), they might not call themselves artists or even seek viewers for their work, which is typically found on their property. In Lucas, it all started with Samuel Perry “S.P.” Dinsmoor, an eccentric Civil War veteran, farmer and teacher who in the early 1900s, at age 64, began building a fantastical sculpture garden in the backyard of his cabin home, located on an otherwise ordinary small-town residential block — which is part of its charm and shock value. The sculpture garden took 22 years, 113 tons of cement and many tons of native rust-stained golden limestone. Now known as the Garden of Eden, and listed on the National Register of Historic Places, it includes the unique cabin — also made by Dinsmoor, out of limestone “logs” — and the garden, with sculptures representing biblical figures (most notably Adam and Eve) and populist themes (most memorably, labor being crucified by the lawyer, doctor, preacher and banker). Herman Divers’ car made of vintage soda can pulltabs is at the Grassroots Arts Center in Lucas. A macabre highlight is the 40-foot ziggurat-shaped mausoleum that Dinsmoor built, also with limestone. Inside, as Dinsmoor wished, visitors on a tour can see what remains of his face — he died in 1932 at age 89 — through a glass-lidded coffin. Nearby, unseen, is his first wife. At age 81, Dinsmoor married his second wife — his 20-year-old housekeeper. They had two children. Since Dinsmoor’s day, locals and transplants — including grass-roots artists and aficionados — have helped cement Lucas’ claim to fame. It now attracts more than 10,000 visitors a year. I’ve visited several times since the late 1980s and each time, I’ve found more to see in an area that still feels refreshingly off-the-beaten-path, making it a perfect outsider art outpost. Returning this spring with my Kansas-born husband, eight years after our last visit, we found more art dotting the highways, near where the art was made, offering fresh views and insights. In addition to Jim Dickerman’s metal and bones work found along Hwy. 14 (mile markers 181 and 182), California artist and retired dentist Fred Whitman’s facial portraits of local residents are carved into limestone posts along Hwy. 232 (mile markers 12 and 13, east side; 14 and 15, west side; and 16 and 17, east side). Joining several others on a guided tour of the Grassroots Art Center, opened in 1995, we marveled at painstaking work of Kansans, including Herman Divers’ full-size car made from vintage soda can pulltabs and John Woods’ elaborate collages made from toys, keys and even handguns found in the muck of a drained lake. In the outdoor courtyard, an exhibit opened in 2002 showcases the region’s “post rock” limestone masonry. Lucas is Post Rock Country, where stone masons during the turn of the 20th century made fence posts — and many buildings — out of the limestone because the treeless prairie ruled out wooden posts. As for the Garden of Eden, it looks better than ever, thanks to a major 2012 restoration of the garden and cabin supported by the Wisconsin-based Kohler Foundation. Sculptures once darkened by age are now cement-colored, with dabs of pink that even some tour guides didn’t know were there. From the Twin Cities, Lucas, Kan., is 672 miles southwest, via Interstates 35 and 70 to Exit 206 and Kansas Hwy. 232. Florence Deeble Rock Garden/The Garden of Isis: The rock garden is the handiwork of a Lucas teacher, inspired by S.P. Dinsmoor to create her own backyard masterwork in the 1930s, using colored concrete to fashion “postcard scenes” from her travels. In 2002, Lucas artist Mri-Pilar transformed the 1906 Deeble House into a recycled art installation, lining the walls with foil, salvaged dolls and toy slinkys. Roy and Clara Miller’s Park: Relocated beside the Garden of Eden, this mid-1900s creation is a miniature town built with rocks, minerals and shells by a local couple in their yard. World’s Largest Collection of the World’s Smallest Versions of the World’s Largest Things: Artist Erika Nelson’s tiny versions of giant things — including Minnesota’s big lutefisk and ball of twine — are on view, by appointment, at 214 S. Main St. Text ahead of arrival (1-785-760-0826; worldslargest­things.com). Post Rock Scenic Byway: This 18-mile stretch of Kansas Hwy. 232 connects the towns of Lucas and Wilson, running past Wilson Lake and Wilson State Park, with hiking and mountain bike trails, swimming beaches, boating and camping. Also drive Hwy. 18 east from Lucas to Lincoln and Hwy. 14 south from Lincoln to I-70. Take time to admire the imposing limestone buildings in windswept Lincoln and Wilson. Brant’s Market on Main Street in Lucas has made bologna and sausages since 1922. Garden View Lodge (1-785-658-6607; airbnb.com), across from the Garden of Eden, is run by a Garden tour guide and Dinsmoor descendant. Midland Railroad Hotel (1-785-658-2284; midlandrailroadhotel.com) in Wilson was a film set for the 1973 movie “Paper Moon.” Open for dinner, the 1899 hotel’s Sample Room Tavern serves regional fare including chicken-fried steak. Garden of Eden: 1-785-525-6395; garden-of-eden-lucas-kansas.com. Grassroots Art Center: 1-785-525-6118; grassrootsart.net. Betsy Rubiner, a Des Moines-based travel writer, writes the travel blog TakeBetsyWithYou. Tagged as garden of eden, grassroots art, Kansas, lucas ks. 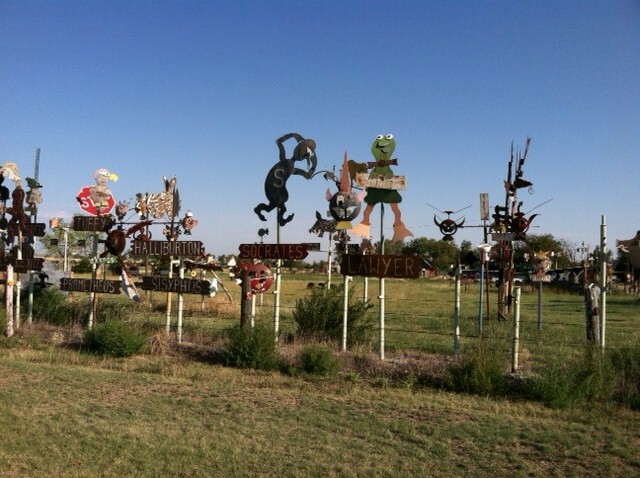 Grassroots art – eccentric work by self-taught, prolific everyday folks (ranchers, farmers, welders, homemakers) – is everywhere in the out-of–the-way northwestern Kansas town of Lucas. it is actually fitting that art that is so “out there” should be way out here, far from the mainstream of most things, including the art world. The garden and house — also a work of oddness, made of limestone logs — sits on an otherwise normal Kansas small town street, which is part of the charm and shock effect. But the garden and its sculptures in particular have never looked better after a recent massive multi-million dollar restoration funded by the Kohler Foundation ( from the Bath works company in Wisconsin). We also found artworks in fields on Highway 14 heading to Lincoln and along Highway 18 to Lucas and Highway 232 back to Wilson and the interstate. One disappointment: Brant’s meat market, which has sold homemade bologna for 90-some years in downtown Lucas, closed in January but the word on the street (literally from two townies sitting on a bench outside the market) is that it will reopen this summer, thanks to a new buyer. 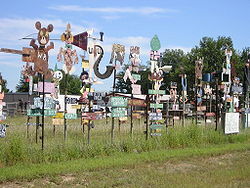 photos of the eccentric sculptures in Mullinville Kansas! The folk art sculptor I wrote about yesterday is M.T. Liggett and there’s a great article about him, plus a slide show, in the Wall Street Journal from 2010.
a small sampling of the sculptures along the Highway in Mullinville, Ks. See: http://online.wsj.com/article/SB10001424052748703630404575053632726040838.html#slide/1 (slide 3 is a photo of M.T.) and http://online.wsj.com/article/SB10001424052748703894304575047461204497670.html. We did drive down the narrow dirt road lined with more curious sculptures past his studio to see what pissed off the city council and found several homemade private property-keep out signs in the middle of the road, which he appeared to claim as his property. We are guessing that’s the issue – or one of the issues – with the powers that be in mullinville. I wanted to ask him a bit about his politics but conversation didn’t move in that direction. We’re guessing he’s somewhere between a libertarian and an anarchist. While grassroots art can be found – as it should be – scattered in random rural locations throughout Kansas, there also is a self-conscious concentration of it in the small Kansas town of Lucas which has a storefront museum in some old limestone buildings devoted to grassroots art. This is the art stereotypically practiced by self-taught, iconoclastic loners – like farmers and ranchers – but also by trained artists and savvy hipsters living in remote places and it ranges from enticing odd to childlike to a little scary. A relative of folk art, grassroots art sometimes is called visionary art, naïve art, or primitive art. In the backyard is local Lucas legend Florence Deeble’s Rock Garden – a rather worn collection of “concrete postcards” – sculptures depicting famous places Florence visited, such as Mount Rushmore. A few blocks away, is the real Lucas masterpiece (which inspired young Florence and spawned the Grassroots Art Center) known as The Garden of Eden. Again, stay tuned. Tagged as garden of eden, grassroots art, grassroots art center, Kansas, lucas ks. A Wall Street Journal reporter seems to be mining the kooky Kansas beat, which I used to fancy as my own. 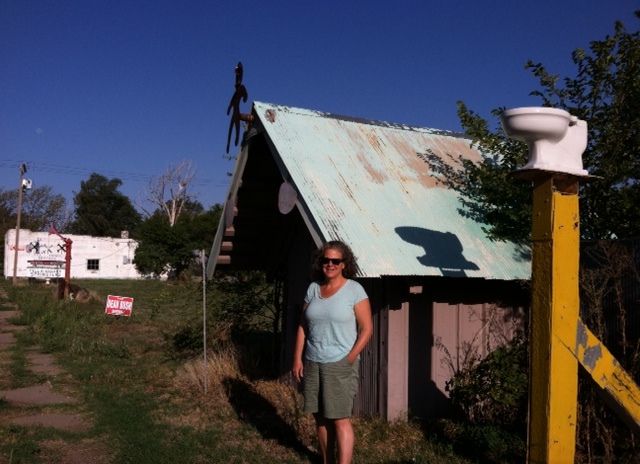 After writing about the Big Well in Greensburg, Ks., she wrote a piece on the eccentric roadside sculpture in nearby Mullinville, Ks., pop. 202, which has long been a source of fascination for my family as we drive to and from my in-laws house in western Kansas. Last December, in addition to slowing down on the not-that-busy state highway to look more closely at the ever-growing line of scrap-metal whirligigs, many of them with political references of an indeterminate nature, we turned north on a country road in town and past the sculptor’s workshop – a shed with heaps of scrap metal and half-finished whirligigs (maybe that’s gigs.) There must be several hundred by now along the road – made of junk metal, glass bottles, presumably pilfered road signs, toilet seats, tractor gears, bowling balls, all whirling in the wind. From the WSJ story, we learned that the sculptor is 79-year-old farmer named M.T. Liggett, that his subjects include three former wives and many girlfriends including one portrayed as a mouse in pearls holding a piece of cheese, caught in a mousetrap. (Guess that relationship didn’t go so well.) Among his favorites is one of Bill Clinton with a padlock welded to the zipper of his pants. Word has it that the American Visionary Arts Museum in Baltimore – which I was dismayed to discover was closed on the Monday I visited – is displaying Liggett’s work. It’s part of a genre of art by self-taught folks known variously as grassroots art or naive art – and Kansas is full of it. Stay tuned. Tagged as grassroots art, greensburg, Kansas, lucas ks.